I have happily plunged head first into decorating my 2018 Fall Living Room. 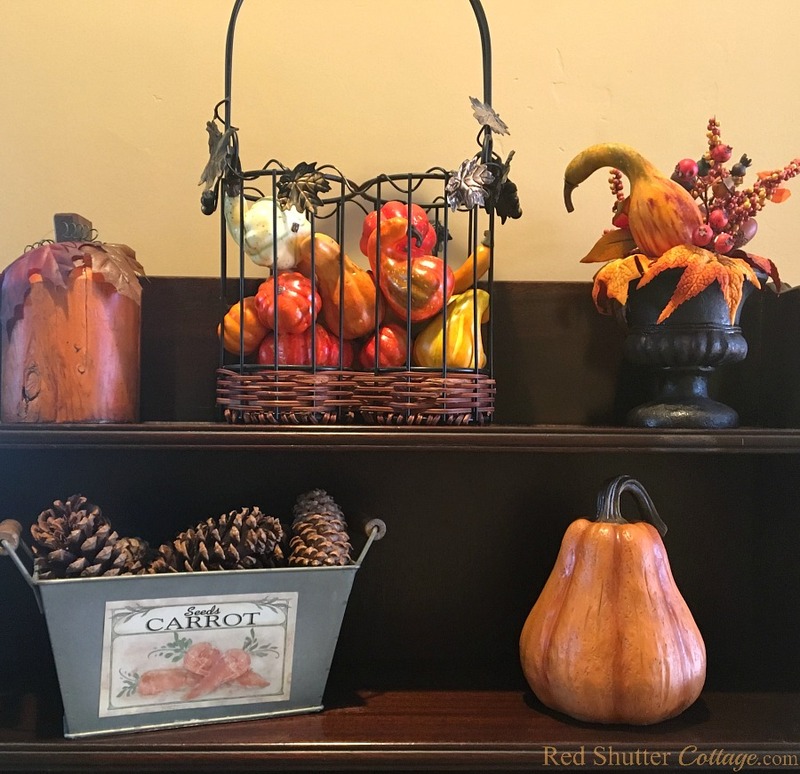 Filling my home with fall colors and decor gives me a sense of homecoming. Something deep inside me responds to the warmth and range of colors that are so welcoming and comforting. 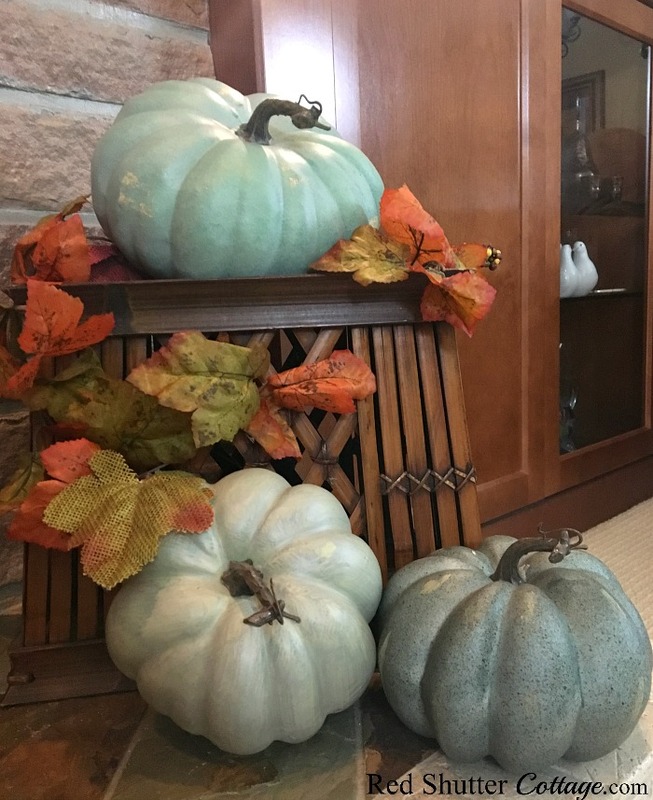 The richness and variety of and textures, the shapes of pumpkins, leaves and gourds…it all creates a feeling within me that is both calming and quietly joyful. 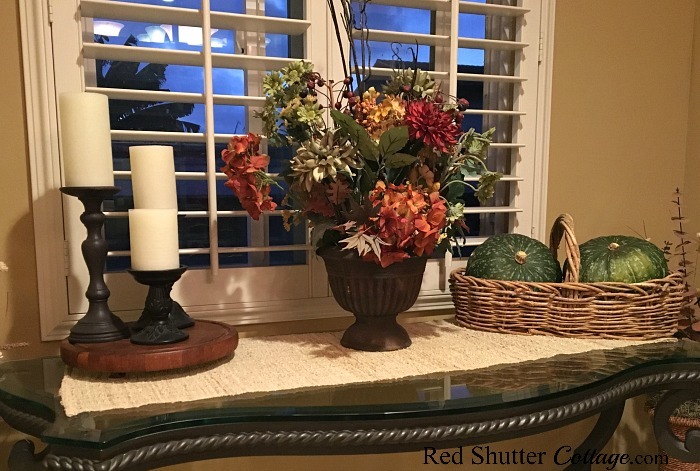 I hope to share some of that with you here in my 2018 Fall Living Room. 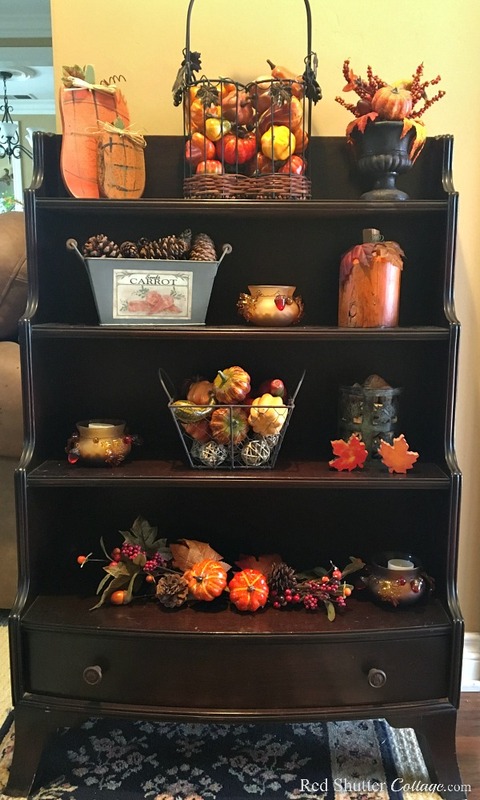 In our entry way, my Grandmother’s display shelf always holds seasonal decorations. 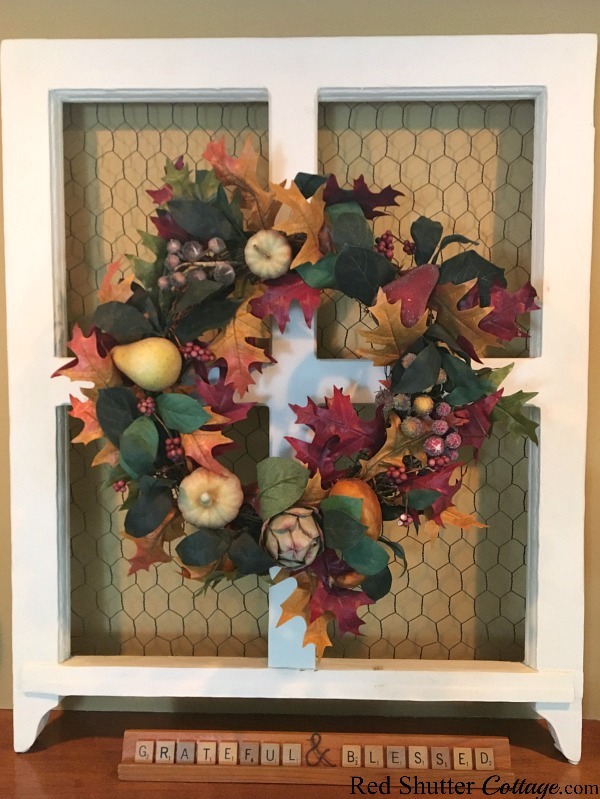 Included are a collection of wooden pumpkins from craft fairs, and a chicken wire basket filled with more harvest fruit. I love this little wine basket from a thrift shop. I think it’s designed to actually hold two bottles of wine, and since it has come to live with me, it usually holds wine corks. But for fall, I filled it with a tumble of mini-pumpkins. 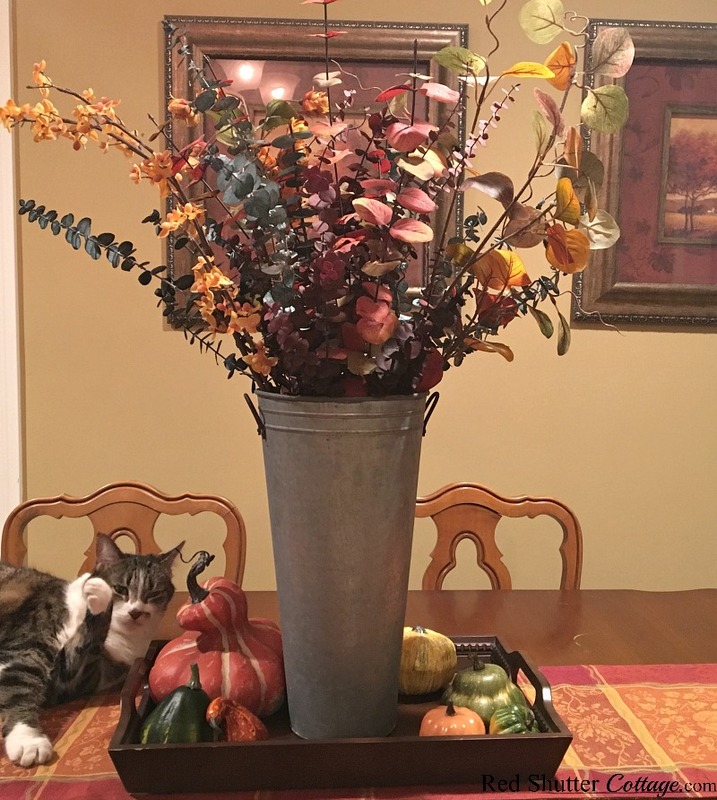 I also added one of my galvanized metal ‘bins’ filled with pine cones and assorted fall foliage. 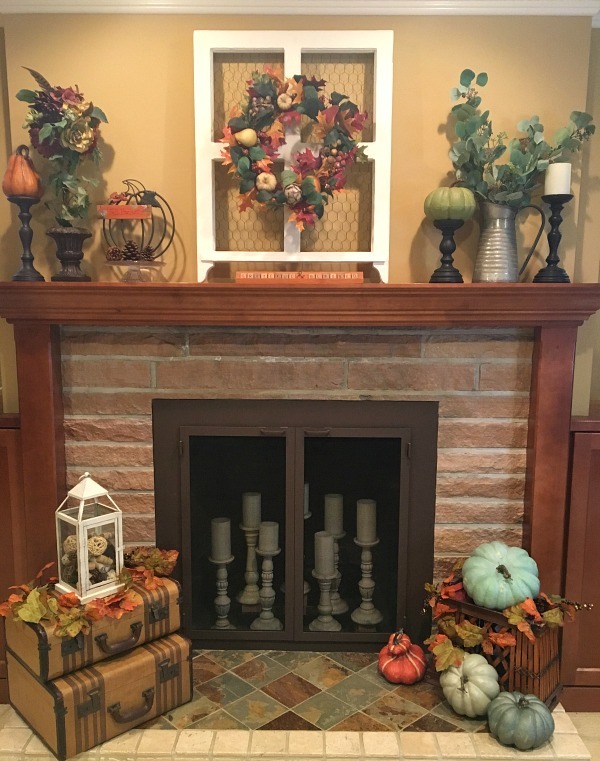 On the mantel, I mixed in the everyday ‘support players’ (candleholders and candles, lantern, greenery) with a fall topiary, and various colors of pumpkins and leaves. 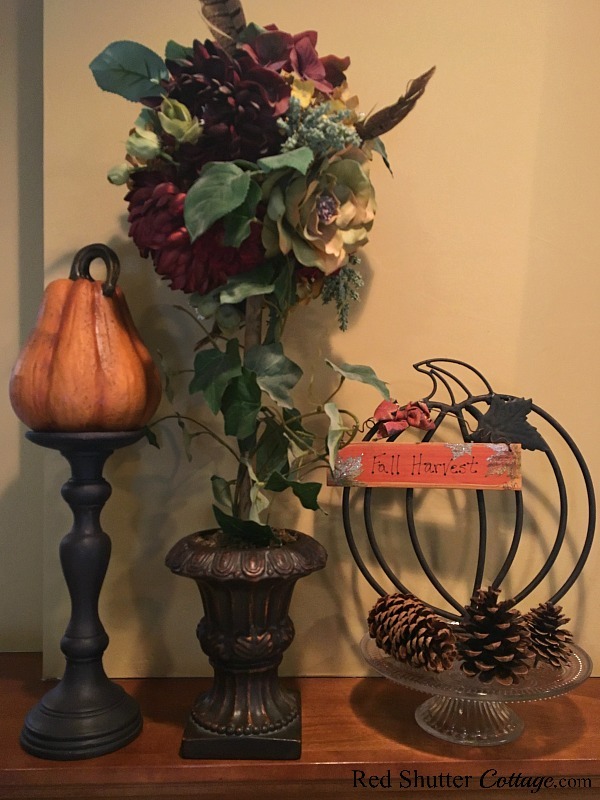 This fall topiary has been one of my favorites for years (although she might be showing her age a tad bit), as well as the wrought iron pumpkin adorned with the “Fall Harvest” sign. 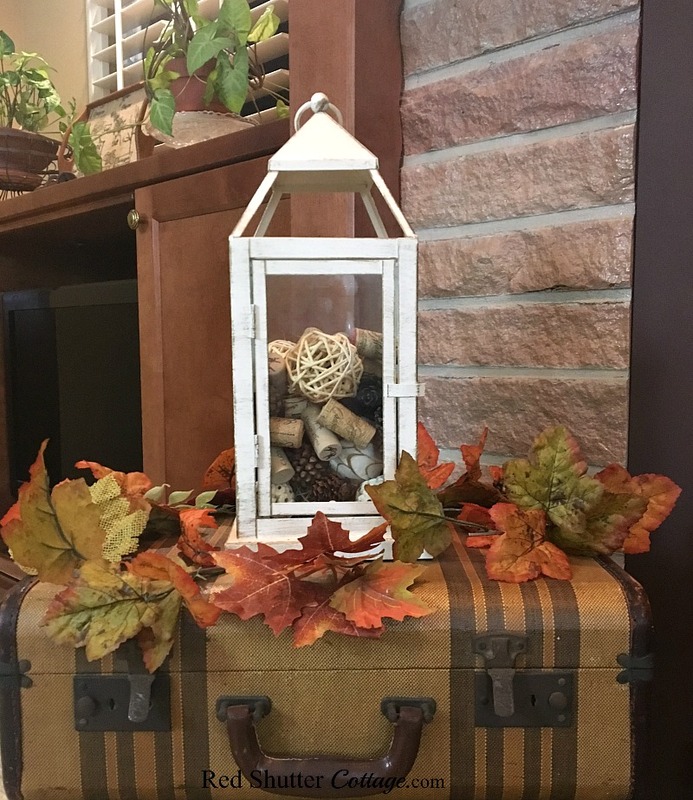 A simple fall look of a lantern filled with wine corks, pine cones, and willow balls, in a bed of leaves. And my big ‘step-outside-of-my-comfort-zone’ turquoise and blue pumpkins! 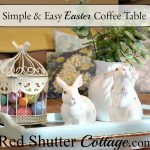 For the coffee table, I started with a few default support pieces: a straw runner and this large flat basket I found in the 50% off section of a consignment store, my Mother’s pewter pitcher and a chicken wire basket. 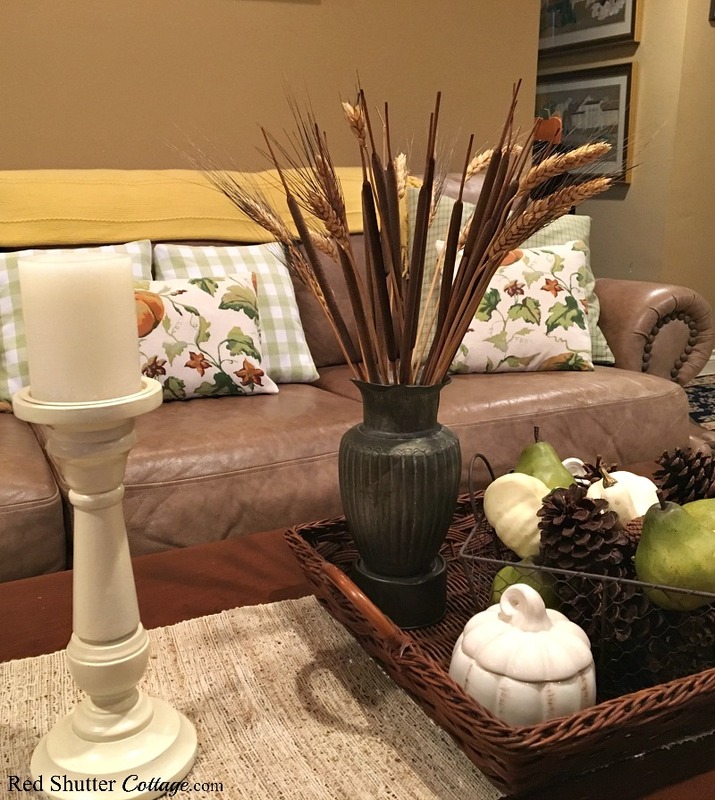 Then I added the elements of fall: a bundle of wheat, a couple of white ceramic pumpkins, and a mixture of mostly pinecones and green pears, with a small scattering of white pumpkins. I tried to keep the colors in a very specific and limited color palette, and used lots of texture for contrast and interest. 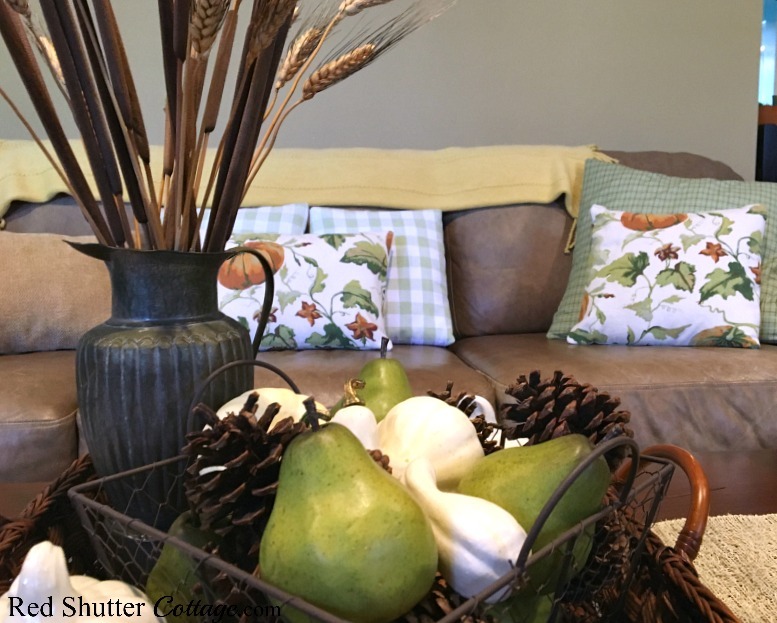 On the sofa, a collection of pillows in a range of fall colors: gold, green, brown and pumpkin! I found the green plaid fabric at Walmart back in June, but there was something about it that ‘spoke’ fall to me. The pumpkin print pillows are actually made from a Cynthia Rowley tablecloth that I have had for a few years. It’s one my favorite tablecloths, and I had to think twice about cutting it up for pillows. But I did a search online, found another one on eBay, and out came the sewing machine! I was happily surprised to find that my green buffalo check dish towel pillows fit in quite easily with the colors of the other pillows. Usually I only use them for summer, thinking they are too loud for other times of the year. But no – they’re not too loud. They are bright, fresh and they are buffalo check. How could I resist? 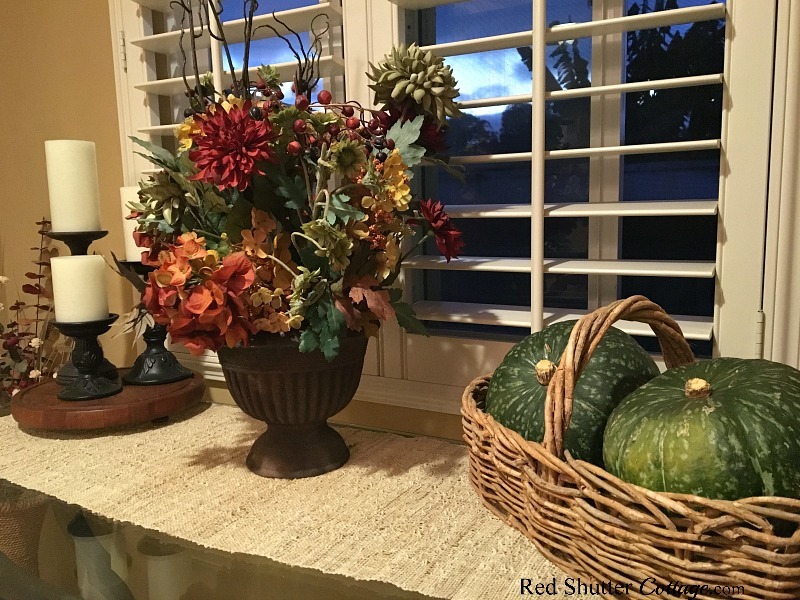 In the dining area, the display table is showing an autumnal bouquet, and a pair of kabocha squash tucked into this thrift store basket. And what do you do with a cat who simply will not be budged from her perch? Lucy just looked so comfortable, I didn’t really have the heart to move her. 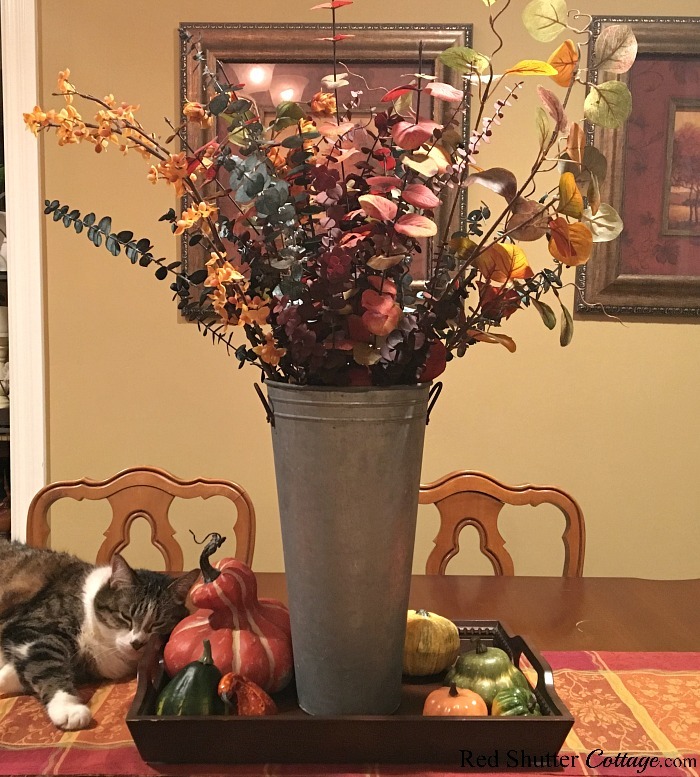 On the dining table I went very simple; a fall plaid runner, plain wooden tray and galvanized metal pail from a rummage sale, filled with an assortment of fall leaves and eucalyptus. The eucalyptus branches are in two colors: a dark teal and a burgundy. Fortunately, the different florals and leaves all seem to work together. 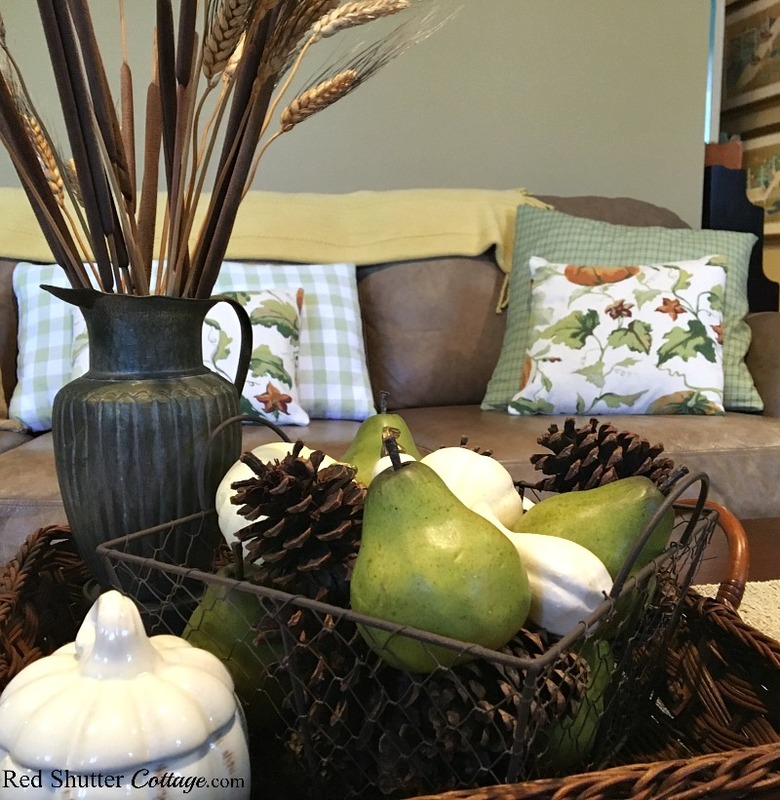 You might also find some ideas in my 2016 and 2017 fall decorating posts. 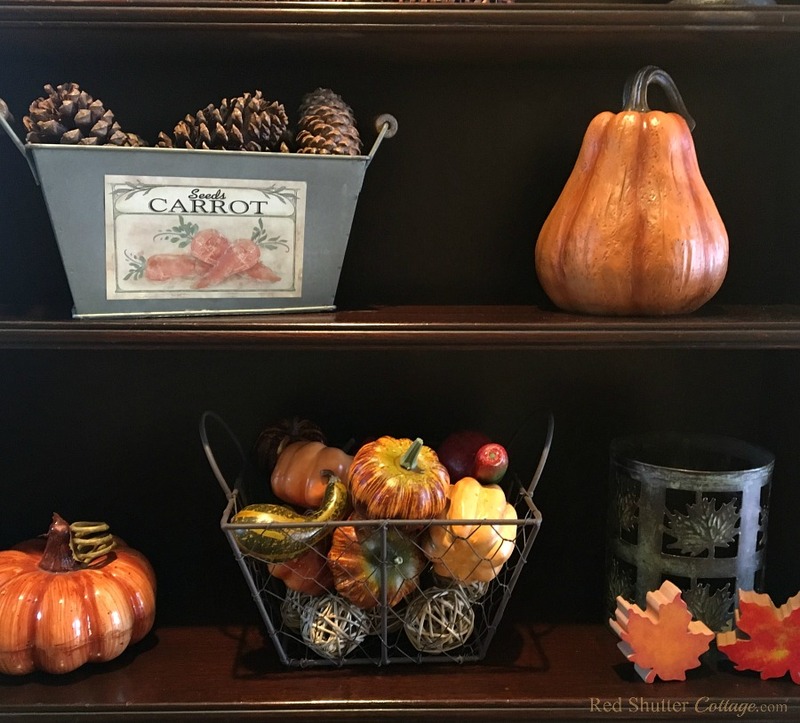 And if you are not a huge fan of the orange, russet, and terra cotta colors of all, please take a look at my post “Decorating with Alternative Fall Colors”. Whatever you do, however you celebrate it, my best wishes to you for a fall season full of fall warmth and beauty. Very nice! 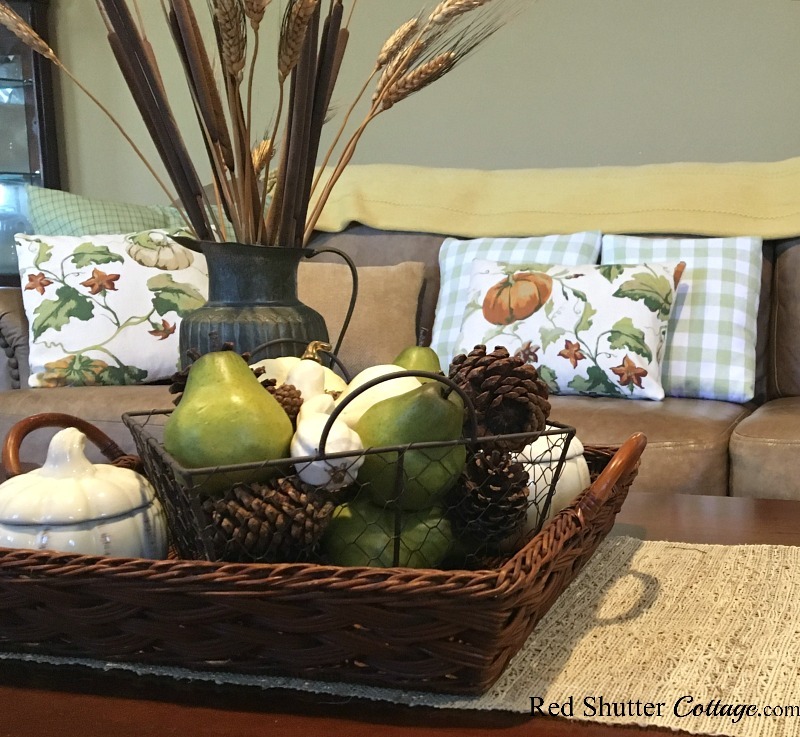 I know how you love to decorate for the fall. 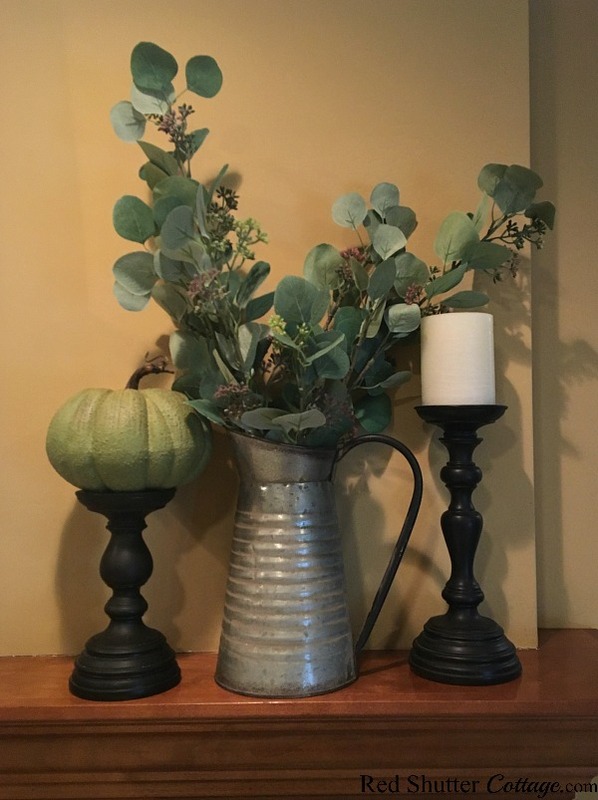 I like how the eucalyptus leaves go well with the teal pumpkins. 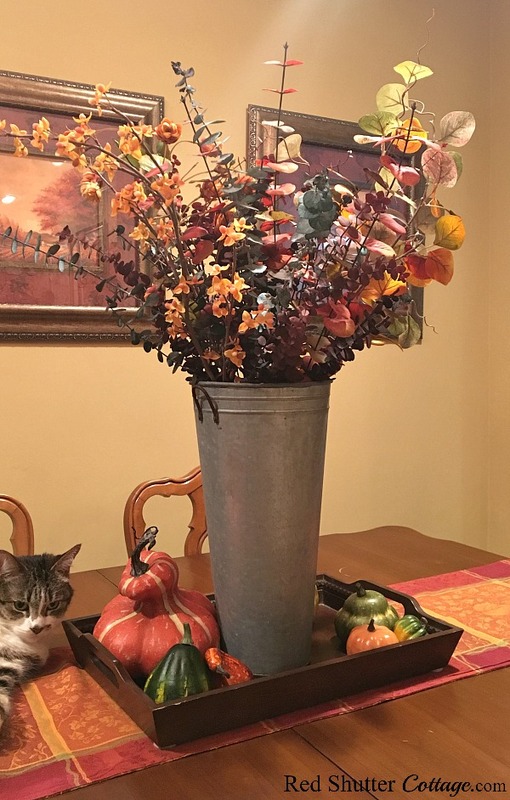 Since I use a lot of teal in my fall decorations, the will work great for me too. Great ideas as usual (and Lucy is adorable)! Thank you Janis! Fall is fast becoming an ‘all-colors-work’ season and I personally think teal is a great color by itself, or as a beautiful contrast against the oranges, russets and terra cottas of fall. That Lucy — what a little ham she is turning out to be! 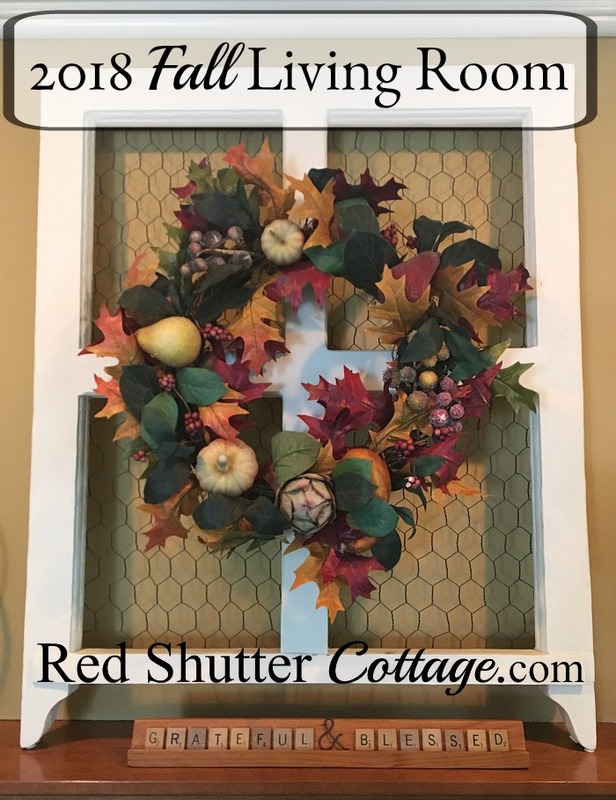 You have made your home look so beautiful and seasonal! I especially like your fireplace and mantle! Thank you so much for sharing with the Hearth and Soul Link Party. I’m featuring this post at the party this week. Hope to ‘see’ you there! Have a great week ahead! April – thank you so much for featuring me! I am absolutely flattered! I appreciate your Weekly Link Party, and how welcome you make us feel! Here’s to many more link parties together! Thank you again! Your home is so lovely. I especially like the old suitcases by the fireplace. You are giving me some ideas. I have lots of old suitcases. Stop by Thursday Favorite Things since you are featured. Beverly – Thank you so much for featuring me! I am truly honored! Those suitcases belonged to my friend’s father…. So they have a little sentimental value as well! And I am so glad they have inspired you! Thank you again — I am so enjoying the link parties!